Pancreatic cancer can be fatal. It is extremely difficult to treat partly because its precise growth mechanism is not clear. One of the characteristics of pancreatic cancer is the presence of fibrous structures or 'desmoplasia' that are found in conjunction with the tumour. Scientists at Okayama University have recently clarified the structure and the mechanisms underlying the emergence of desmoplasia in pancreatic cancer. To understand desmoplasia better it must be replicated in the laboratory. Here, the researchers first analysed desmoplasia from human samples of pancreatic cancer. 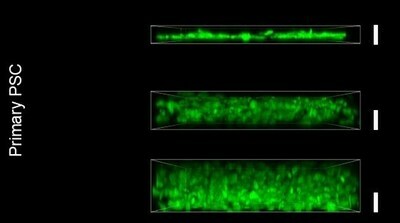 Microscopy revealed that cancer cells were separated from surrounding blood vessels by fibrous desmoplasia cells. The desmoplasia layer was about 10 to 30 micrometers thick, suggesting that if a therapeutic agent were to reach cancer cells from the blood it would have to traverse this distance-a key factor determining the efficiency of drug delivery. Next, the researchers extracted pancreatic stellate cells (PSCs) from patients to create a 3D model of desmoplasia because desmoplasia is formed of these cells. Arranging PSCs in increasing numbers quickly resulted in layers at least 10 micrometers thick, accurately mimicking the desmoplasia in pancreatic cancer. The normal function of PSCs is to secrete the extracellular matrix (ECM), which is a support system that holds cells together. The composition and organization of ECM is severely altered in the desmoplasia. This led the researchers to use their 3D model to understand how ECM changes occur and the role of PSCs with respect to these changes. The model showed the abundance of two ECM components, Fibronectin and Collagen, just as seen in patient desmoplasia. Notably, these components also act as barriers preventing drugs from reaching cancer cells. The trigger that drives the switch between normal ECM and the aberrant ECM in desmoplasia was a major pathway mediated by a pair of proteins TGF-β/ROCK. Activation of this pathway could not only switch healthy fibrous cells into the toxic PSCs, but also result in increases of Collagen and Fibronectin. Lastly, another cancer protein, SPARC, was also found to be involved with these ECM abnormalities, further establishing its relevance to pancreatic cancer. This was the first study to replicate a 3D model of desmoplasia in the laboratory, with relevance to clinical samples. This model successfully revealed toxic pathways that are activated in pancreatic cancer. Such a model has wide ranging implications such as deeper insights into structural and molecular aberrations that drive the disease with the possibility of discovering how to overcome the desmoplastic barrier to facilitate drug delivery to tumour cells. This work has been carried out by a collaborative research with scientists in Tohoku University, Keio University, Osaka University, Hirosaki University, Japan Women's University, and Toyo University. Extracellular matrix (ECM): The ECM is a scaffold made up of different biochemical components. This scaffolding network that is secreted by specific kinds of cells, functions to hold and bind cells in place and facilitate communication between them. It thus acts as an external system keeping cells healthy, strong and functioning correctly. Alterations in the ECM can lead to cellular dysfunction, such as in cancer. Hiroyoshi Y. Tanaka, Kentaro Kitahara, Naoki Sasaki, Natsumi Nakao, Kae Sato, Hirokazu Narita, Hiroshi Shimoda, Michiya Matsusaki, Hiroshi Nishihara, Atsushi Masamune, Mitsunobu R. Kano. Pancreatic stellate cells derived from human pancreatic cancer demonstrate aberrant SPARC-dependent ECM remodeling in 3D engineered fibrotic tissue of clinically relevant thickness. Biomaterials, 2019 Feb;192:355-367. Professor Mitsunobu Kano, M.D., Ph.D.